There is really only one place to begin our prep profiles for the year and that’s at Brewster Academy where head coach Jason Smith and the Bobcats are coming off a historic 2016-2017 season in which they finished with an undefeated record and won both the NEPSAC AAA and National Prep Championships. On paper, last year might not have even been Brewster’s most individually talented team, but they distinguished themselves with their continuity and chemistry and became the first prep school team in the modern era to finish with an unblemished record. Lukas Kisunas and Nate Roberts are the two players who return from last year’s team. Kisunas was the team’s starting center and Roberts provided a high-major big off the bench after coming to Wolfeboro at mid-year. Kisunas is a native of Lithuania and as physically tough a big man as there is in New England. Roberts has continued to grow and added two more inches since his arrival last year. They are set to visit UConn, Old Dominion, Illinois and Nebraska, Syracuse, Washington respectively. Last edited by NERR on Fri Oct 20, 2017 5:24 am, edited 2 times in total. 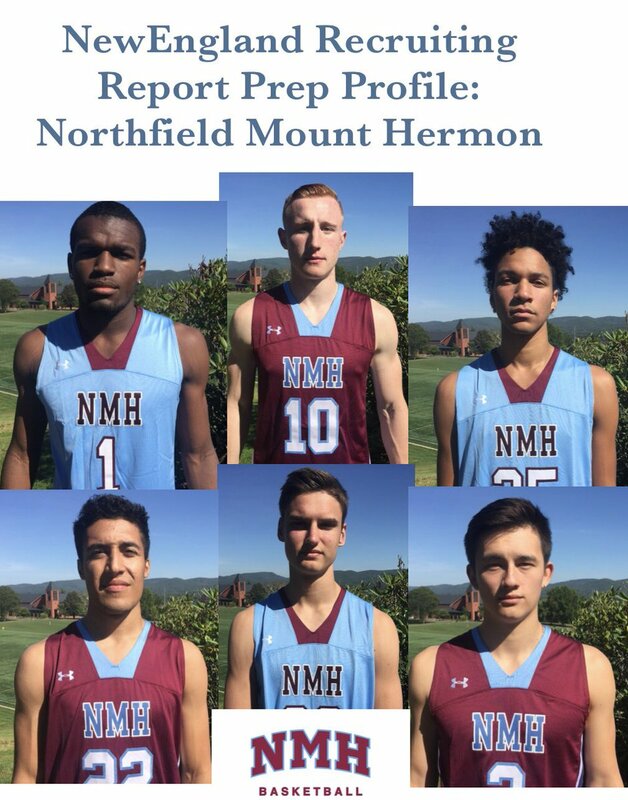 After three different NMH products committed to division I schools earlier this week, it seemed only fitting to close the week with a glance at the collective Northfield Mount Hermon team of 2017-2018. NMH has proven themselves to be an annual contender, both locally and nationally, in recent years all while staying consistent to their commitment to being the best combination of academics and athletics anywhere in the country under head coach John Carroll. Last year they advanced to the finals of both the NEPSAC AAA and National Prep Championships, only to be turned away by Brewster at both spots. This year, with a strong veteran core returning and a couple of impactful newcomers, NMH promises to be right in the hunt. After examining Brewster Academy and Northfield Mount Hermon last week, today we’ll preview St. Thomas More School where head coach Jere Quinn sits at 986 career wins heading into the season. Quinn was nominated for the Naismith Memorial Hall of Fame last year and is expected to be on the ballot again this year, a fitting tribute given both the number of wins and players he has helped to send on to the next level. Now entering his 39th year at the helm of the program, Quinn would join exclusive company in the Hall of Fame as only Morgan Wooten and Bob Hurley, arguably the two most famous high school coaches of all-time, have been enshrined since 1960. As we continue our tour through Class AAA of the NEPSAC we’ll head to New Hampton School where head coach Nick Whitmore begins his second season at the head of the program. In some ways though this second season is more of a new beginning than last year was as almost the entire roster has turned over and quite a bit of young talent has joined the program. It’s a short list – Shandon Brown. Brown is the only returning player from last year’s team and ultimately responsible for showing the newcomers “the New Hampton way” that was first coined under former head coach, and current Dartmouth assistant, Peter Hutchins and carried over when Whitmore took over. Class AAA of the NEPSAC is down to just five teams this year as South Kent School has moved to AA and after having profiled Brewster Academy, Northfield Mount Hermon, St. Thomas More, and New Hampton School over the course of the last week it is time to turn our attention to Bridgton Academy. The narrative really hasn’t changed at Bridgton in recent years as the former NEPSAC powerhouse has been relegated to strive for the role of giant killer as their lack of financial aid dollars has prevented them from competing for the championships they dominated a decade ago. The only common denominator among those distinct generations has been head coach Whit Lesure, a true legend of prep school basketball, who continues to approach the job with no less enthusiasm than he did when his roster was comprised by a collection of mid to high-major prospects. Typically, a new prep program would look at year 1 as an opportunity to get their feet wet and set a stable foundation for the future. The administration at Woodstock Academy, however, had their sights set on being anything but typical and have operated with the goal of winning at the highest level from the very beginning. So they hired an established coach with a winning history then gave him the means to build a successful and sustainable program. Instead of just dipping their toes in the water, Woodstock came to the beach prepared to swim with the sharks! Tony Bergeron takes the reins at Woodstock after spending the last four seasons at Springfield’s Commonwealth Academy. Although the woods of Northern Connecticut offer a stark contrast to his former inner-city campus, Bergeron remains committed to developing under-the-radar talent and relying on a relentless attacking style to make life miserable for his opponents. Class AAA of the NEPSAC remains the pinicle of prep school basketball. Every asset has a correlating liability though and while the likes of Brewster and NMH have taken their programs to unprecedented levels in recent years, while New Hampton and St. Thomas More have remained competitive with the very best in the country, others have elected to drop down to lower levels in hopes of remaining competitive. South Kent is the most recent to follow the likes of MCI, Winchendon, Worcester, and Phillips Exeter, all of whom competed in the NEPSAC's top league ten years ago, but have since moved down to various other classes within the NEPSAC. For as much as things change, when you have established yourself as a top national post-graduate program, they remain the same. And that is what has happened at Putnam Science Academy. This is the first time in four years that the season has begun without Hamidou Diallo in the PSA gym as he is now set to begin his freshman season at Kentucky after enrolling at mid-season last year. Nevertheless, with a roster that is almost entirely new, the Mustangs are once again loaded with talent and poised to be among the national contenders.